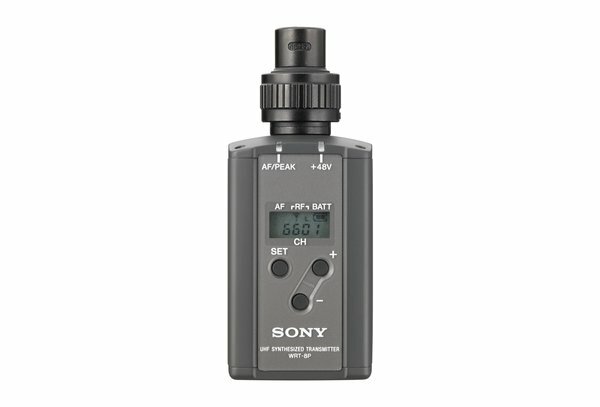 The WRT-8P Plug-on transmitter is the latest addition to the extensive range of Sony WL-800 Series UHF synthesized wireless microphone systems. 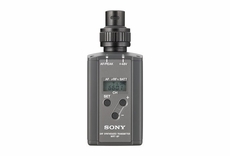 When combined with the workhorse Sony F-112 dynamic microphone, this combination offers an optimized and balanced handheld ENG interview mic/ transmitter package with unparalleled sound quality. Users may select from 188 frequencies, within a 24 mHz range UHF-TV channels 42/44 (42,43,44,45). The WRT-8P offers switchable power (250 mW or 50 mW) and operates for up to 4 hours on a 9 volt-battery when set to 50mW RF output, or 2.5 hours when set to 250mW RF output. In addition to use with a handheld mic, the WRT-8P also accepts line-level audio signals making it ideal for a wide-range of wireless audio production applications. The WRT-8P includes an XLR input connector with switchable +48V phantom power. Battery Life: Approx. 2.5 hours at 250 mW output. Approx. 4 hours at 50 mW output. Audio Input Level: Max. -20 dBV ( MIC, ATT=0 dB) Max. +22 dBu ( LINE, ATT=0 dB)"